This is the sixth time Australia has played Japan since that famous first clash in Kaiserslautern at the 2006 World Cup, but never has there been such a disparity in their fortunes. Japan sits top of the group, where a single point would be enough to secure automatic qualification, and their exciting, creative team has the feverous support of an entire nation behind them – tickets are selling via lottery not only for the game but for seats at the national stadium, simply to watch it on the giant TV screens. It is a remarkable state of affairs, illustrating the pride and confidence the country has in their national side. By contrast, Socceroos supporters are disillusioned, and overwhelmingly negative about the future of the national side. There is widespread animosity towards Holger Oseick, mainly because of his controversial selection policy that benefits the senior players at the expense of younger, rawer talents. It is not just the fans, with rumours suggesting the FFA will move swiftly should results go the wrong way over the next few weeks. In that period, Australia will play Japan tonight, then Jordan at home next week, before a third qualifier against Iraq on the 18th June. Two wins from the three matches seems about right to ensure automatic qualification – or else it will likely be the dreaded South American play-off which a move to the Asian confederation was meant to avoid. Japan and Australia also contrast when it comes to their playing style. Starting with tonight’s hosts, Japan’s recent emergence as an exciting, attacking team seems indebted to the seemingly unexpected influx of creative, technical players – but Japan have always had a history of producing players in this ilk, such as Shunsuke Nakamura, Hidetoshi Nakata and Shinji Ono. Instead, the problem has been with their overall strategy, which tended to be unnecessary cautious under Takeshi Okada, and didn’t maximise the creative ability of their better players. Gradually though, Okada’s replacement Alberto Zaccheroni has been able to coax more proactivity out of his side. Of course, it also helps that he simply has a higher calibre of player to work with – Shinji Kagawa at Manchester United and Keisuke Honda at CSKA Moscow are the obvious examples, but the side also boasts a pair of impressive full-backs plying their trade in high-level European football in Yuto Nagatomo at Inter Milan and Atsuto Uchida at Schalke. Zaccheroni historically prefers a 3-4-3 formation – and experimented with it in last week’s friendly against Bulgaria – but will almost certainly go with his usual 4-2-3-1 formation here. At the back, the two full-backs both like to get forward, but Zaccheroni instructs only one of them to get forward at the time. That means with the central defenders staying very deep in covering positions, and one of the full-backs next to them, Japan sometimes appear close to that 3-4-3 formation that is Zaccheroni’s trademark. In front of them, Makoto Hasebe protects the back four alongside Yasuhito Endo, who is the more creative player and will collect possession from the defence before firing accurate passes into the feet of the attacking players. It is in this zone that Japan are most exciting – with the three behind central striker Ryoichi Maeda switching positions sporadically in a fluid, attacking unit. Kagawa drifts in quickly from the left into central playmaking areas – the space where Honda also operates – but the CSKA Moscow striker often breaks forward in behind the opposition defence, to provide an extra goal-scoring threat. On the right is Stuttgart striker Shinji Okazaki, who generally plays upfront for his club team – so is always moving inside from the right into central striking positions. The Socceroos system is far more basic. A constant theme of Oseick’s reign has been his preference for a 4-4-2 formation. You could call it 4-4-1-1, or 4-2-3-1, but in basic terms, it features two banks of four supporting two central attackers – not much more to it. It will feel like a particularly boxy 4-4-2 should he select the widely anticipated front two of Josh Kennedy and Tim Cahill, who will play high up and look to attack crosses from out wide. In those positions, a combination of Tommy Oar and Robbie Kruse seems likely – both have enjoyed good seasons at FC Utrecht and Fortuna Dusseldorf respectively, and are quick, intelligent dribblers who can both dart down the outside of the defender, or cut inside towards goal. The full-backs are heavily involved in attacks – they don’t get forward on the overlap, but regularly cross from deep positions, particularly from the right, where Luke Wilkshire aims crosses towards the far post for Cahill to chase. That conservative positioning will actually help Australia here, as it won’t leave too much space for Japan to counter into. Off the ball, Australia will defend in two banks of four, with the midfield dropping off somewhere close to the halfway line, the wide players tracking back, and the front two staying reasonably high up the pitch, trying to collect quick long balls on the counter-attack. The key tactical feature is Australia’s physical presence at centre-forward – their greatest strength, and Japan’s greatest weakness. Their captain Hasebe has spoken at length about this – “I think they’ll come at us with long balls frequently, so we have to contest those balls and improve our efforts on the second balls” – and it has shown to be an issue for Japan in the past, particularly during the 2011 Asian Cup final. Their centre-back partnership will be Southampton’s Maya Yoshida and Gamba Osaka’s Yasuyuki Konno – neither of whom are particularly strong in the air, and in fact was the pairing that started that Asian Cup final. This will be a fairly basic battle – Australia will whip balls in, and Japan will try to clear them. Width from Uchida and Nagatomo is very important for Japan, and with their energetic, purposeful running down the sides, they complement the narrowness of Okazaki and Kagawa higher up. However, they can sometimes get forward to cross and find that their delivery is very underwhelming – which isn’t surprising, considering that Maeda isn’t a particularly outstanding striker. The by-effect of this is, of course, that they can be exposed down the flanks on the counter-attack – and so Oar and Kruse must be diligent with their tracking, but also ready to spring forward on the break. Oar must be particularly switched on – Uchida gets forward with great effect for his club side, where his width is similarly vital given that ahead of him, Michel Bastos frequently cuts inside towards goal. Meanwhile, on the opposite flank, Nagatomo has a small physique and likes to stay tight to his man – so like Holman did in the Asian Cup final, Kruse will try and drag him inside to open up room for Wilkshire. Nagatomo must also be targeted aerially, with Cahill likely to drop off into a zone just outside the far-post, and then charge towards left-sided crosses from Matt McKay and Oar. 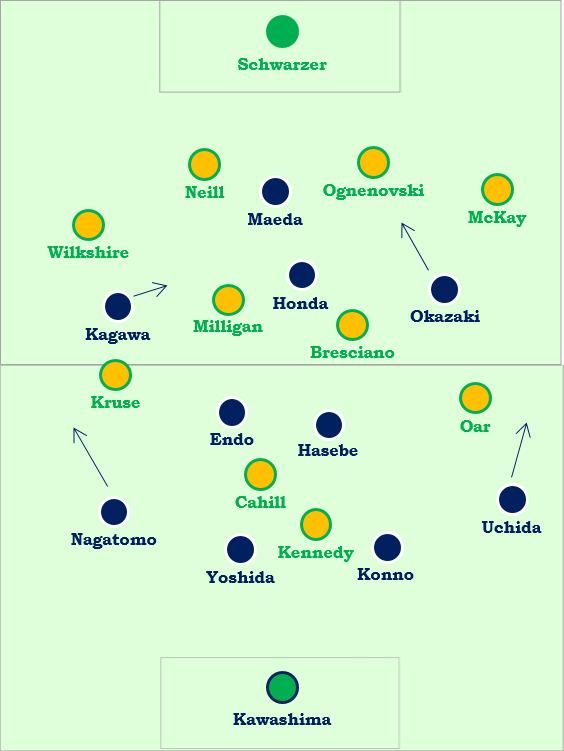 Just as Japan will have to battle Australia’s strength, the Socceroos will have to face Japan’s strength in the playmaking zone, that broad, immeasurable zone between the lines of midfield and defence, where Kagawa will dribble into quickly, and Honda will be near-permanently stationed. However, Honda’s clever movement must be noted – in what might be a consequence of his time spent playing as a ‘false nine’ at the 2010 World Cup, he sometimes drops deep towards the play and help spread the ball wide, or break forward into natural goalscoring positions. Takashi Inui won’t start, but the Eintracht Frankfurt left-winger is another creative option off the bench. Oseick has generally preferred a ‘solid’ midfield duo of Mile Jedinak and Carl Valeri during his time in charge, but Valeri has been out for most of the season, and Jedinak is coming into the match under a fitness cloud. Both would have played disciplined holding roles in front of the defence, and thus helped Australia stay more secure in that zone – but it’s questionable whether Jedinak’s absence might actually help Australia. At Crystal Palace, his worst games have come when up against technical playmakers compared to the more physical battles with classic centre-forwards, where he excels. He doesn’t have outstanding acceleration, and might have struggled against the quick interchange from Japan’s creative players. Instead, either Mark Milligan or Michael Thwaite appear likely to play in that holding role, with the former a particularly useful option for Oseick, given his outstanding performances for Melbourne Victory in that role this season. Australia Scout has previously suggested that the Victory look far more secure with Milligan in that holding role – he’s positionally clever and works hard to close the gap between midfield and defence, a problem area for Postecoglou’s side. There’s also a question mark about the other midfielder. As mentioned earlier, Oseick would probably have preferred playing with a ‘secure duo’, but appears forced to play at least one of Marco Bresciano or James Holland in that role. Both are more deep-lying playmakers than holding midfielders, and while their inclusion should make Australia’s forward passing from midfield more positive, they like to play slightly higher up the pitch and could leave Milligan/Thwaite exposed. Bresciano, in particular, is a weak defensive player, and while that might not be a problem against weaker sides like Oman, it is a concern here. Holland is stronger, but appears out of favour under Oseick. Bresciano might be included for his additional threat at set-pieces – his delivery from out wide and at corners is very good, and with Australia likely to play with an aerially strong front two, free-kicks and corners might be an important factor. Japan’s threat at free-kicks will be Honda, who will shoot on goal whenever possible from direct free-kicks – so Australia must avoid cheap fouls around the edge of the penalty area. Australia will play out quickly towards the front two when they win possession – not the most appealing nor the most sophisticated approach, but a practical one. Japan will want to play a slower, more methodical brand of football, trying to play short passes out from the back and build up possession slowly into the attacking third. Key to this is Endo, a national legend now plying his trade in the second division of Japanese football. His mobility and athleticism might be in question, but his technical ability is certainly not – and either Cahill or Kennedy, or both, must drop back onto him when out of possession and prevent him from playing easy passes forward.